POLL: Which country of the former Yugoslavia has the best song at Eurovision 2019? Even though Yugoslavia split over twenty years ago, the region shares a rich history and culture which defines both its placing in the world and on the Eurovision stage. In fact, it is the region itself which coined the now famous term “Balkan ballad” — an often slow and emotional take on the power ballad. It just wouldn’t be Eurovision without one. At this year’s Eurovision, we see a typical Balkan ballad in the mix courtesy of Serbia’s Nevena Božović. Croatia’s Roko gives us an English take on the genre — and a very large set of wings. North Macedonia’s Tamara Todevska sings of being proud — both of womanhood and heritage, and the manifold other characteristics that make all of us unique. Montenegro’s D mol harks back to a sound of decades past — working their harmonies as they strive to take us to “Heaven”. And Slovenia’s Zala Kralj & Gašper Šantl give us the purest of moments — standing close and looking into each other’s eyes as she sings and he plays his instrument. Romance is very much alive. But the question is: Which Ex-Yugoslav country has the best song at Eurovision 2019? You can listen to all of the songs below and then vote for your favourite. You can vote for as many acts as you like, but you can only vote ONE time. Be sure to click the box next to each of your favourites before pressing submit. D mol will represent Montenegro at the 2019 Eurovision Song Contest in Tel Aviv with the song Heaven. Tamara Todevska will represent North Macedonia at the 2019 Eurovision Song Contest in Tel Aviv with the song Proud. Nevena Božović won the Serbian selection Beovizija with the song Kruna. She will represent her country at the 2019 Eurovision Song Contest in Tel Aviv. Zala Kralj & Gašper Šantl will represent Slovenia at the 2019 Eurovision Song Contest in Tel Aviv with the song Sebi. Which ex-Yugoslavia country is your favourite this year? Do you think it will win Eurovision? Let us know in the comments below. Serbia and Slovenia are mt favourites here! Slovenia. No doubt about that! Crostia’s song has similiar melody like “Fantasiaa” (Finland 1983). Why hasn’t anyone noticed this plagiarism? Slovenia the best, i even think this going to do very well in the final..
Easy: Slovenia and North Macedonia! Both will quality and do better than Serbia and Montenegro. 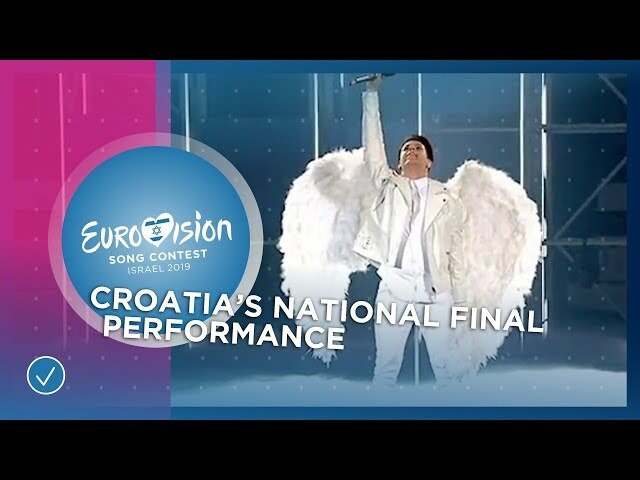 …And please, please tell the Croatian guy not to wear those angel wings. Several singers have done that before. The vocal abilities don’t seem to be very important any more. Unlike many other ESC-fans, I’m not impressed by Zala’s whispering. It depends – if it fits the song. Imagine Zala’s song would be sung by Christina Aguilera. That would be horrible and ruin the feeling and meaning of the song. This is SONG contest, not voice contest. Look at Lena 2010, she’s not a very good singer but Satellite is one of the best ESC songs in history. I’m looking for music that I love and can listen to, not girls in dresses shouting at me. I mean, it’s good, but one of the best ever is certainly an overstatement. Ukraine should’ve won in 2010 if you ask me. Slovenia has a muffled mumbo jumbo as an excuse the girl can’t sing at all. For me Slovenia is top 5. Serbia and North Macedonia are 15-20. Croatia and Montenegro are bottom 3 with Georgia. For me Slovenia is high above the rest, I really hope they will qualify and do well! Serbia is nice too, the rest is meh. Btw, if you could also vote here it would be amazing! All you need to do is sending me your points! I want to see North Macedonia, Serbia and Slovenia in the final. All three of them deserve it! Proud, Crown, Oneself! Esc IS a festival, among other things, and explaining why is pretty much pointless to narrow minded people like you. About Montenegro, was there some revamp or it’s just me? It was awful when I heard it for the first time and now it’s… Well, it’s not bad. I doubt that it can qualify, but it’s not at the bottom anymore, that’s for sure. Yes, Montenegro underwent a revamp, giving it some instrumental ethnic vibes at parts. Wow, what an easy question: Slovenia, the only good song. Serbia and North Macedonia are decent. The other two I’m not even gonna comment, my 41-st and 40-th place. Portugal is old-fashioned classic orchester ballad and Slovenia a modern computer and beats driven alternative song. How is it even similiar? Apparently, every slow song = Salvador 2.0 and every song with instrumental chorus = Eleni 2.0. I believe Slovenia is the dark horse of the year. Serbian girl here; Slovenia obviously. Sebi all the way!! That’s in my top 3… I like North Macedonia as well. 1. There seems to be a lot of genuine love for North Macedonia’s entry. Is that because of the song, or because of Tamara, or something else? 2. Roko’s army of fans haven’t yet found this poll. Are they taking the week off? You are the first person I have seen with exactly the same ranking as me. I totally agree with everything in this post. In order: North Macedonia, Serbia, Slovenia. Montenegro is okay, but bland and that earbleed nightmare from Croatia shouldn’t be thought or reminded of. People may say he has a great voice, which I agree with, but it should be used wisely and properly and, HONEYYYYY, this song ain’t showing the way how it should be. None of them is a surefire qualifier, but I think that Slovenia has a good shot of making it in Semifinal 1 and I wouldn’t be surprised to see Serbia going through. Montenegro has no chance and I think Semifinal 2 will prove too hard for any of the other two. My top: 1. Slovenia 2. Serbia. 3. Croatia. 4. Montenegro. 5. North Macedonia. As a Balkan languages lover, I would love that. Tamara, hands down. She’s my second favourite after Italy and I’m making myself to the fact that I’ll be end up crying if she doesn’t qualify. Or fall like previous entries. Well there was an instagram story of tamara singing the chorus of Proud in a club in N Macedonia if im not wrong and it sounded brutal! Prove us. No believing until there’s a solid source. I’m in the #TeamSlovenia and #TeamSerbia! For the Macedonian entry, I like it but I need a powerful live from Tamara for better appreciating ‘Proud’. The studio version doesn’t give me goosebumps. Slovenia is the only one with a good entry. The ex-Yugoslav area is really weak this year. Montenegro, Serbia and Slovenia might be bordeline qualifiers, but honestly I can’t see any of them doing well. I absolutely see Slovenia and Serbia qualifying this year. Slovenia obviously. It is very daring in its own way, and very different. The rest of the ex YU is the worst Eurovision has on offer this year. Slovenia is second to none here. Australia, Belarus, Belgium, Cyprus, Finland, Greece, Iceland, Portugal, San Marino, and Slovenia. Shame about Poland and the Czech Republic (Belarus and Finland over them? Really? ), but hey, it’s science. She was particularly attracted to Greece, so I think we have our semi winner. Now, I’m curious about Second semi!